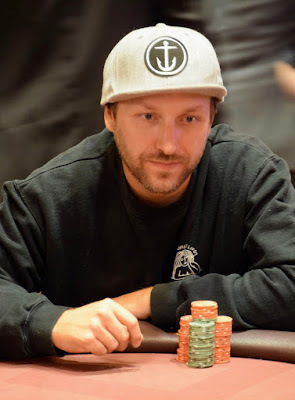 Josh Morrow - down to 1BB in Day 1A - moves all in on a 6-6-4-3 board and Vincent Amayun calls for what looks to be almost the same 4 milly stacks. Morrow shows A5 for an open-ended straight. Amayun has K6 and flopped trips. The board blanks and Morrow is once again down to 1BB, and now he's all in from the BB in the next hand. Only Chris Stevens comes along and is way ahead, 96 to the 92 of Morrow. The board, however, disagrees as it runs out J-J-8-8-Q for a chop. One more hand for Morrow, and he moves all in from the SB for 185,000, with all four remaining players seeing the 8-2-J flop. Amayun bets out 500,000 and Stevens and Sok Chean get out of the way. Amayun shows 89 for middle pair. Morrow shows QT for a gutter with two overs. The board runs out K2 and Morrow finishes in 4th place, collecting $11,400.